Whether planning the perfect holiday party or a simple, casual get-together, the classic appeal of party board games canʼt be beat. Not sure which game or games might suit your crowd? Board Games For Me is here to help! Board games are great for all types of groups, whether itʼs family, friends, work associates, or even groups of various ages. A party board game can be a hit when a group of long-time friends get together for laughs or with a crowd at a Christmas party where an icebreaker helps acquaintances bond. These games are good for any occasion. Moreover, itʼs easier to get the gang together when the game is quick and easy to learn, socially interactive, and inclusive. The goal is to have a good time, not focusing on complex strategies or rules. Laughter is the best measure for successful play. Above all, your games should encourage your crowd to engage in activities that are fun and/or funny. Hereʼs my personal list of top party board games. Please let me know your comments, questions, or if you have any other choices that you feel should be on the list. Remember, spend more time playing games and less time finding them. Party on! Telestrations "The Original" for 8 players is what got the party started! Object of the game? To laugh - A lot! 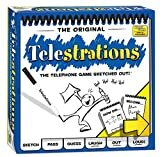 Telestrations is perfect for family parties, fun with friends or entertaining a crowd. No drawing skills required! Telstrations is the visual version of the classic “telephone game” where you draw what you see, then guess what you saw to reveal hilarious outcomes! Each player starts with their own erasable sketch book, marker and word card. A roll of the die determines each player’s secret word. The timer gets turned and everyone draws their word. After 60 seconds, everyone passes their book to the player on their left. Then each player takes a few seconds to guess in words(s) what they see, and passes again. The timer is turned and everyone draws the guess.This continues until everyone’s sketch book passes by every player and returns back to its original owner, where it’s time for The Big Reveal. Everyone shares their book and the hilarious miscommunication is revealed. Just like the game of “telephone,” the outcomes are unpredictable and the laughter is contagious! 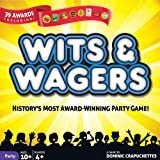 Wits and Wagers, the game of guts and "guesstimates", is a fast-paced game that combines the most interesting elements of trivia with the excitement of gambling. Whether it's the dramatic "all-in" question or the thrill of winning more chips, Wits and Wagers makes any gathering a party! Wits & Wagers is history’s most award-winning party game. Why does everyone love Wits & Wagers? Because you don’t need to know the answers to win! The excitement is betting on the best guess. First, everyone writes down a guess to a fun question like “In inches, how tall is the Oscar statuette?” Then players bet on which guess is closest to the right answer. Strike it big and you'll be cheering like you just hit the jackpot! 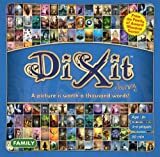 Dixit Journey is a wonderful way to practice your skills at creating unique and subtle clues, while your friends test their abilities to bluff and mislead. A picture is truly worth a thousand words in this beautifully crafted board game that will be enjoyed by all. In each round one person assumes the role of active player where they create a clue made up of one or more words or can even be a sound or group of sounds. The other players will then try to mislead everybody by finding a card in their hand that also represents the same clue. Test your skills at correctly finding the solution to the clue. Play Out of the Box Word on the Street Junior, the hilarious tug of words game! On each turn one team flips over a category card. Team members frantically brainstorm words that fit the category while the opposition tries to sidetrack them. The team must agree on a word and pull each letter of that word one lane closer to their side of the street all before the time runs out. Word on the Street will have you in the fast lane to fun! Ages 13 to Adult. 2-10 players. 5 Minutes to learn. 20-30 minutes per game. Two teams race to identify drawings done by their own team members. But, the artists don? ?t know what they are drawing--they can only follow the instructions given by another team member. Laughter erupts as players attempt to follow direction and to guess what is being drawn. With backseat drawing, there's no time to stop and ask directions-- the fun never stops. Say Anything will have YOUR friends talking and laughing in minutes! Every player answers a fun question like “What’s the worst thing to say to a cop after getting pulled over?” or “Who’s the most annoying celebrity in show business?” Then players try to choose which answer the judge will like best. Play Say Anything and find out what hilarious things YOUR friends will say!